The Hainanese Polo Bun at Keng Wan Hing Coffee Shop, Gaya Street. Being one of the oldest coffee shop in town and located at the most happening Gaya Street of Kota Kinabalu. It was my second attempt on their famous Pineapple Bun a.k.a. Polo Bun. I never had any Polo Bun in town with real Pineapple Marmalade which normally found with butter in it. On 30th May, it was public holiday in Sabah in conjuction with Harvest Festival celebration. Before we start our shopping at the local mall here, we went to the coffee shop for breakfast. ;-) We were lucky to be there when those bread were just served hot from the oven. The warm soft bread texture and the sweet pineapple marmalade just perfect for light breakfast or afternoon tea, especially when it is serve with a cup of black coffee or a cup of Teh C (milky tea). Once I was being informed that even tourists from Indonesia bought 400 (four hundred) pieces - NO JOKE!! As souvenirs to their friends and family back to Indonesia. Opposite to RHB Bank, Gaya Street. The buns looks so good as seen in the pics. Pineapples are my fav so this must be a great try. Wish they had the same outlet at my place. I can understand why people from Indonesia buy so many pieces. Is the row of this shop opposite of the RHB bank row? When passby there, my mom also definitely will buy them and she keep mentioned the polo bun is the most delicious one. I must try polo pau (which is my awesomely favorite bake stuff to eat) when I get back home to sabah this july!!!!!! Ah, my family and I always get our buns here. It's fresh and delicious! It's like they make it out of love instead for the purpose of making money. Haha. 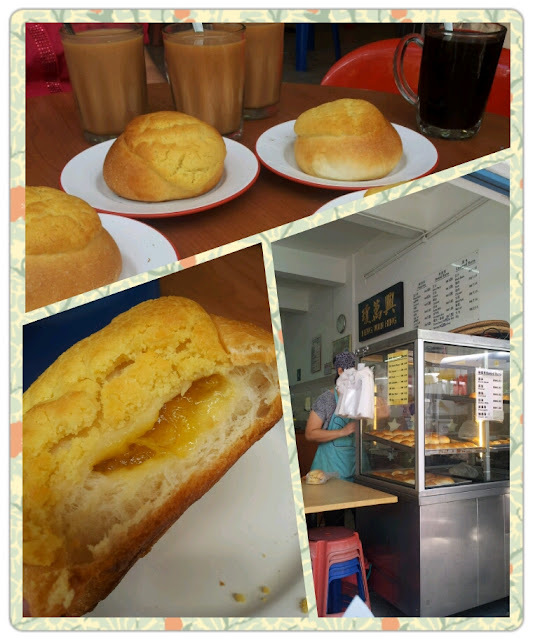 I like these kind of kopitiam..
:) Yup. I love the feel as well. Wow! The pineapple polo bun looks yummy!! Look so yummy leh!!! Wanna try it myself one day!! :) hahaha :D it smelllllss GOOD!! No o.. Haven't visited Beijing yet. this reminds me of the bun in Starbucks. yummy!! polo bun with pineapple? that's interesting. i wonder if we have the same in kl. Looks really good. Is it similar to the Hong Kong style one with the butter, except they use pineapple, or are the other differences? Yes. Just like you said. But HK bun is much larger than ours here!! Looks really good. Is it similar to the Hong Kong style one, except that they use pineapple instead of butter, or are there other distinctions?